Constellations consisting of tens, hundreds, and even thousands of satellites in non-geostationary orbits (NGSO), sometimes referred to as mega-constellations, are now being proposed and developed to bring affordable broadband internet and other satellite services to the world. Hundreds of launches may be required to deploy and maintain these satellites. Even after successfully navigating through rounds of investor funding and regulatory approvals, launch capacity and delays pose a significant risk to constellations, their stakeholders, and policymakers because the constellations must be deployed within a defined period, and failure to do so has onerous consequences. 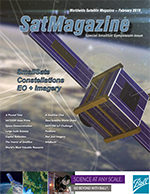 This article defines the magnitude of the NGSO constellation challenge in terms of number of satellites proposed, regulatory deployment requirements, the uncertainty in future launch demand, and the inevitability of launch delays. Sources and consequences of launch delays are identified, and risk management and simulation tools are described. The possibility of a high launch demand and the cumulative effects of launch delay risks could result in far-reaching consequences for U.S. launch service providers, constellation developers, and other stakeholders. The evolutionary stages of the proposal, approval, deployment, and sustainment of NGSO constellations should be followed closely to discern launch demand and delay risks for individual constellations and at a macro-level for the launch service and NGSO constellation markets. Quantitative assessments can shed light on the probability of satellite services availability and the potential for future market imbalances such as shortages of launch vehicles and spaceport capacity limitations. Stakeholders, armed with launch demand and risk assessments, will be better positioned to adjust business strategies, capture needed investments, adjust government budgets, and effect changes in regulatory policies. It is both prudent and practical for stakeholders and investors to forecast launch demand and manage delay risks that threaten mission success and investment returns. Private industry has proposed approximately 20,000 satellites for deployment into non- geostationary orbits, as shown in Table 1 below, with approximately 13,000 having been approved by the Federal Communications Commission (FCC) thus far (while there might be other constellations in addition to those listed below, the table represents U.S. license requests). Three companies — OneWeb, SpaceX and Boeing — are proposing constellations comprising thousands of satellites to provide global broadband internet access and other companies are proposing smaller constellations. The FCC oversees spectrum use by commercial satellites and has put in place regulations to prevent “warehousing” of spectrum and orbital slots. Warehousing occurs when a developer with exclusive rights is unwilling or unable to deploy its satellites and thus hinders the availability of commercial space services to the public that competitors might be able to provide.1 Time is of the essence for constellation developers, as the FCC requires that they deploy 50 percent of their satellites within six years of license approval and 100 percent within nine years. *2 Satellites must be operational to be considered part of the count. * The rules in place prior to 2017 required the entire constellation to be deployed within six years of being granted a license. Failing such, the grantees’ entire authorization was voided. Failure to meet either of these milestones results in the constellation being limited to the number of satellites already in operation on the milestone date. For example, a constellation planned for 100 satellites that has only 40 satellites in operation at the six-year milestone would have their FCC authorization reduced to 40 satellites. The licensee would need to request a license modification to deploy and operate additional satellites above that new limit and FCC approval would not be guaranteed. Future launch demand is driven by government and commercial plans to deploy satellites. 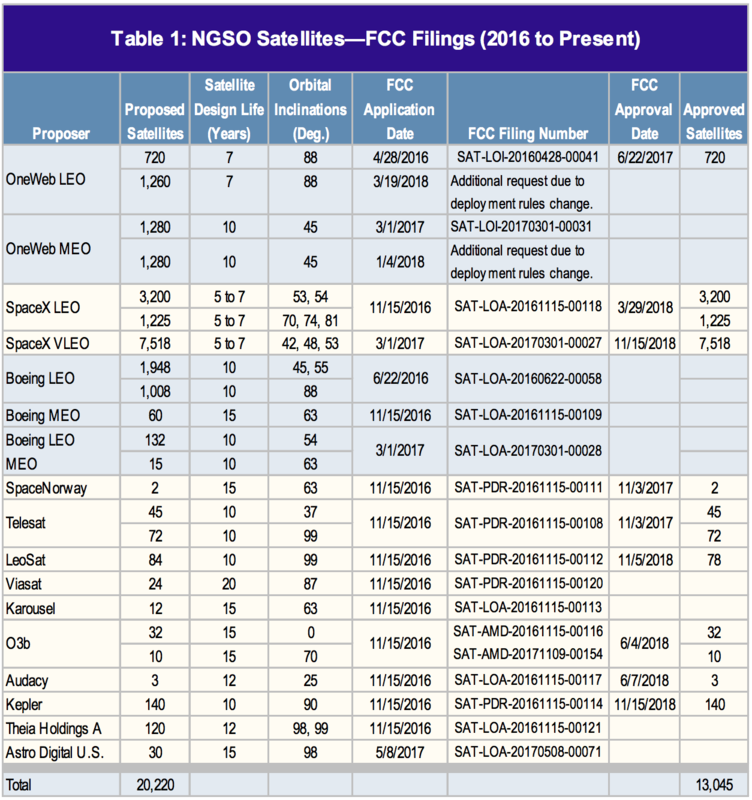 The FCC, through its regulatory function of reviewing and approving NGSO constellations along with the attendant six and nine year deployment requirements, acts as a gatekeeper for launch demand. The U.S. government uses multiple launch opportunities per year to meet various defense and civil missions. The burgeoning commercial Earth observation satellite industry is another source for future launch needs, with potential quantities in the thousands.3 Commercial communications satellites destined for geosynchronous orbits will also continue to be launched each year.4 Government decisionmakers need reliable aggregate launch forecasts to make timely and informed decisions. Clearly, a large increase in launch rates would be required to deploy 20,000 satellites. Whether such an increase is even possible remains to be determined. “Some also question whether there are sufficient launch capabilities to get all of these [NGSO] satellites into orbit in time to meet the [six- year and nine-year deployment milestones],” according to FCC commissioner Michael O’Rielly.5 Additionally, some financial and technology challenges remain to be overcome. Consequently, between unforeseen technology setbacks, potential mergers, acquisitions, bankruptcies, and market withdrawals, the number of satellites needing to be launched might be much less. The number of launches required will be directly correlated to the number of satellites actually needing to be launched. To demonstrate the range of launches that might be needed, we considered multiple scenarios for the number of satellites needing to be deployed. These were 25, 50, 75, and 100 percent. Trying to estimate the total number of launches required to deploy the proposed satellites is problematic because the FCC does not require license applicants to provide its launch plans. 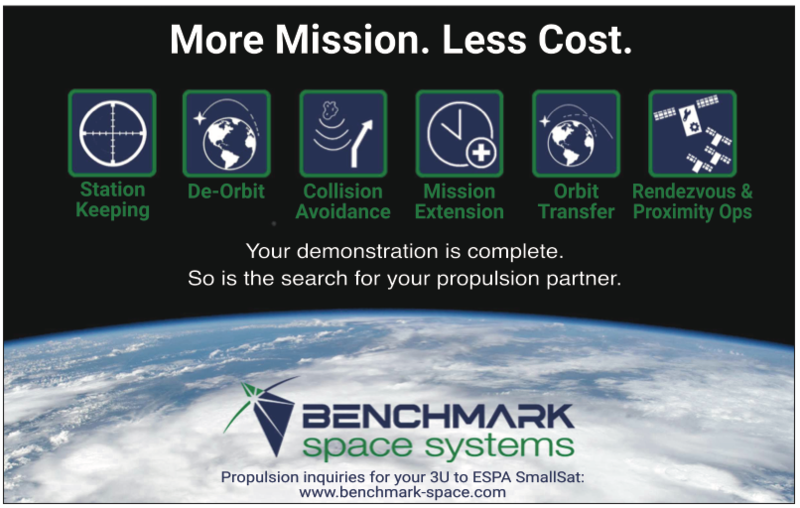 To develop reasonably accurate estimates, information on satellite mass and volume, anticipated failure rates, on-orbit spares plans, planned deployment schedules, planned launch vehicles, planned launch sites, and number of satellites that can be launched by any single launch vehicle is needed. Aerospace developed a rough estimate for the total number of launches required for the deployment scenarios by taking into account publicly available information and making a few simple assumptions. For example, at least one launch is required to populate an orbital plane. Fewer satellites can be launched when the intended orbit is highly inclined or is above Low Earth Orbit (LEO). We also considered historical information regarding the number of Iridium NEXT satellites (10) that are launched by a single Falcon 9 and OneWeb’s stated plans to launch as many as 36 satellites at a time on a Soyuz rocket. We then assumed that the constellations are approved at the end of 2018 and that launches occur in time to meet the FCC deployment milestones with at least one year of margin. We further assumed that deployment launch rates will ramp up over the first few years such that the peak annual flight rate will not occur until approximately 2023. 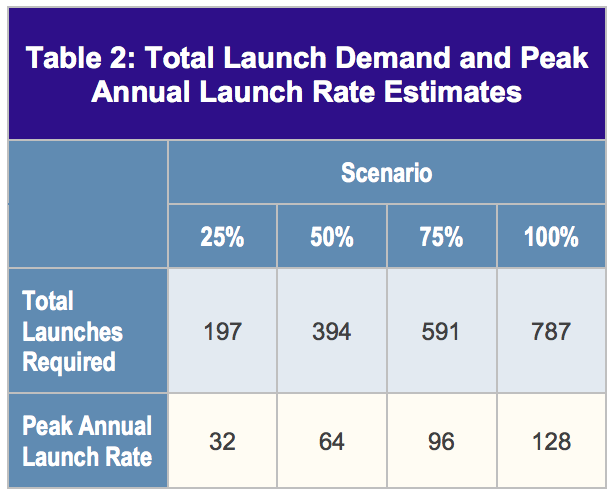 The resulting estimates for total launches required and peak annual launch rates are shown in Table 2. In addition to planned launches to deploy the constellations, future launch rates also depend upon satellite design life. A useful satellite lifetime is the most significant factor in determining the required number of launches and frequency to sustain a constellation. Likewise, OneWeb has indicated a seven year design lifetime. Consequently, SpaceX and OneWeb may need to begin launching replacement satellites prior to the FCC’s nine-year milestone. Using the information from Table 1 regarding number of satellites and design life, and assuming a six-year design life for SpaceX satellites, the estimated number of sustainment launches are shown in Table 3. Such uncertainty has enormous implications for future launch demand. It is also worth noting that the 125 LEO satellites in that study had an average design lifetime of less than three years. Satellites in LEO typically require additional propellant for orbit maintenance compared to satellites operating in higher orbits. The Very Low Earth Orbit (VLEO) satellites will likely require even more fuel. Design tradeoffs between satellite launch mass and volume versus lifetime will have implications for both the number of deployment launches required and subsequent sustainment launches. We assume that constellation satellite replacement cycles will be accomplished using medium to large launch vehicles capable of deploying multiple satellites at a time similar to the initial deployment approach. For example, Iridium upgraded its constellation to Iridium NEXT by launching up to 10 satellites at a time on Falcon 9s. This was planned well in advance and provided Iridium with a cost- effective way to deploy 75 satellites. On orbit failure risk can be addressed by having a small number of on-orbit spares in each orbital plane. However, a higher- than-anticipated failure rate would require more launches to complete deployment, and the deployment completion date could be delayed. Note that studies indicating a three-to-five percent first- year failure rate followed by a failure rate of less than one percent per year were based largely on satellites that were produced in low volumes and underwent rigorous testing. Consequently, these failure estimates may not be predictive for mass- produced satellites that do not undergo similar testing rigor. The satellite mortality rate for each constellation will likely be an area of considerable uncertainty until that constellation has been fully deployed and operated for several years. There is a wide range of estimates for the potential number of failed satellites needing to be replaced on an annual basis; again, depending upon the number of satellites actually deployed, the number of spares put on orbit during the initial deployment, and the actual failure rate. 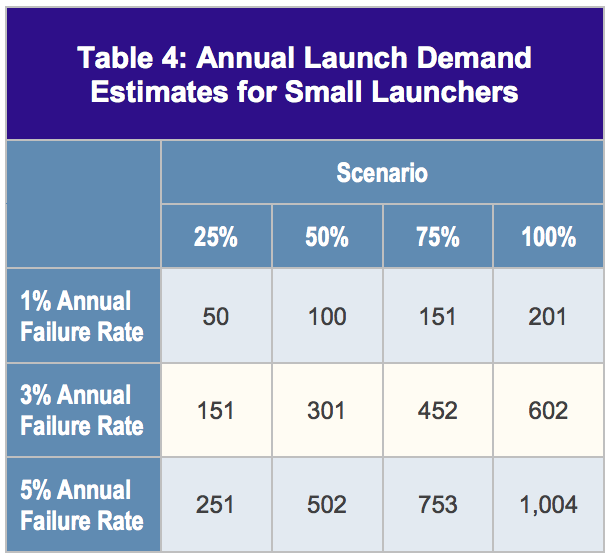 Table 4 provides projections for future annual small launcher demand, discounting availability of on-orbit spares, and assuming failed satellites are replaced on an individual basis. The number of satellites in the proposed constellations and the FCC deployment milestones, creates the potential for a launch availability shortfall. To quantify the magnitude of the potential shortfall during the deployment era only, we first estimated the present launch capacity for all medium and heavy launch vehicles likely to be used for the initial deployment of the NGSO satellites. We then considered how many non-NGSO launches are typically required on an annual basis. The United States conducted 31 orbital launches in fiscal year 2018 using SpaceX, United Launch Alliance (ULA), and Northrop Grumman (NG) medium- to heavy-lift launch vehicles of the type that will be needed to perform constellation deployments. SpaceX conducted 21 launches in fiscal year 2018 (FY18), which is a new record for them. In FY17, they launched 13. ULA conducted nine launches in FY18. In prior years, they launched as many as 12. NG conducted one orbital launch in FY18 and demonstrated up to two launches of Antares in prior fiscal years. Thus, the currently demonstrated combined SpaceX — ULA — NG orbital launch capacity is 35 launches per year. Existing international launch vehicles such as Ariane 5, H-IIA, Proton, and Soyuz are also likely candidates for deploying the constellations. The peak historical flight rates for these vehicles have been seven for Ariane 5, six for H-2, 12 for Proton, and 22 for Soyuz, for a total annual capability of approximately 45 launches. Launch vehicles from China and India might also be considered, but they remain constrained by U.S. restrictions on export of satellites containing U.S. technology. Combining the present U.S. capability with the capabilities of the international launch vehicles cited above suggests a present capability of approximately 80 medium-to-heavy class launches per year. However, much of this capacity over the next 10 years may already be tasked. The Federal Aviation Administration (FAA) estimates that the next 10 years will average 18 launches per year for large commercial geosynchronous satellites.11 A total of 32 U.S. and foreign government launches were conducted during FY18 on a combination of Antares, Atlas 5, Delta II, Delta IV, Falcon 9, Soyuz, Proton, H-II, and Ariane 5.12 Consequently, on the order of 50 launches per year seems a reasonable estimate for future launch demand before addressing the new constellations. Given a capacity for 80 launches per year and an existing need for 50 launches means that there are approximately 30 launches per year available for NGSO deployments. 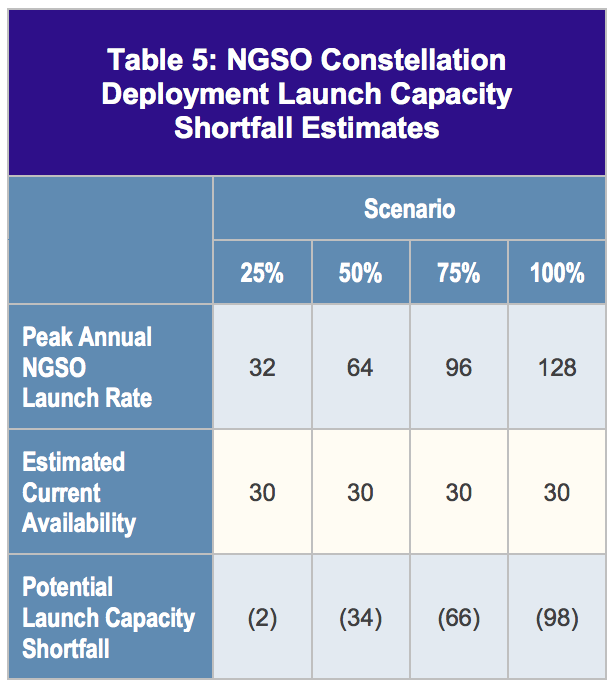 Given an existing availability of 30 launches for NGSO constellation deployment, the potential capacity shortfall ranges from small to large as shown in Table 5. The results suggest that even if only a quarter of the NGSO plans come to fruition, current launch service providers will be tasked at maximum proven capacity. 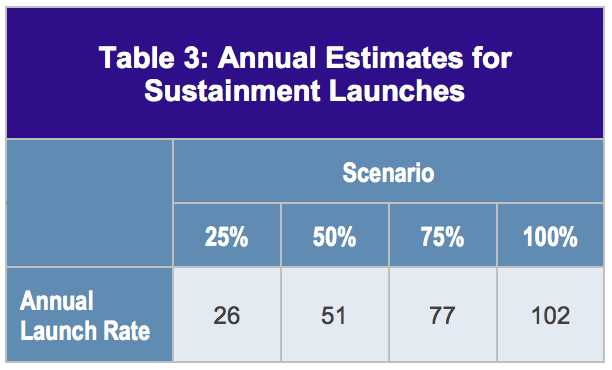 If the percentage of NGSO satellites needing to be deployed exceeds 25 percent, then the projected shortfalls indicated could become problematic (see Table 5). Such a market imbalance could lead to price increases, which could incentivize existing launch service providers to increase capacity and entice new launch service entrants. Ramping up launch rates of existing vehicles will take time and considerable investment. For example, it took SpaceX eight years to increase its flight rate from 1 to 21 per year. It is worth noting that the past couple of years have seen a sharp increase, and the advent of the highly reusable Falcon 9 Block 5 may enable higher launch rates. However, recent comments from SpaceX suggest that FY19’s launch rate will be on par with FY18 due to decreased launch demand.13 ULA took 12 years to increase its flight rate up to 12 per year. New medium-heavy lift rockets are in various stages of development. U.S. vehicles include SpaceX’s BFR, ULA’s Vulcan Centaur, Blue Origin’s New Glenn, and Northrop Grumman’s OmegA, the latter three of which were recently awarded development contracts from the U.S. Air Force. Internationally, the European Space Agency (ESA) is developing Ariane 6 as a replacement for Ariane 5 and the Japanese Aerospace Exploration Agency (JAXA) is developing the H3 to replace the H-II. All are expected to have initial launch capability in the early 2020s. Given the historical record of how long it has taken to ramp up flight rates, these new vehicles cannot be counted upon to erase a potential 100-launch shortfall in 2023. The fact that the shortfall is a projection with considerable uncertainty is particularly problematic for launch service providers developing new capabilities. This is because it is vitally important for providers to match their production capacity to launch demand to ensure profitability. See “Launch Diseconomies of Scale” later in this article. When the FCC approves a proposed constellation, the race is on to meet the six-year and nine-year deployment milestones. As proposers generally wish to have the FCC license in hand before too much investment is committed, the design of the constellation components — including the satellites and ground infrastructure — generally are not complete. Thus, the race includes design, development, securing capital funding, constellation deployment, and sustainment. As such, all delays during the time frame from license approval through the nine year, 100 percent deployment milestone are of interest as they lead to launch delays. Because constellation performance and viability depend heavily on the number of operational satellites in orbit, significant launch delays can be devastating. Depending on deployment schedule margins and the extent of launch delays, profitability may be significantly reduced or never achieved, particularly in light of the federal regulations cited above. The advent of NGSO constellations creates new opportunities for customers and stakeholders alike. Corporations, government agencies, health providers, academic institutions, and members of the public are keenly interested in taking advantage of the new services that the constellations will be offering. However, they will need to continue using their existing services until these new constellations come online. Some examples of opportunities and risks for stakeholders and other interested parties are described below. Launch service providers will need to be able to launch the new NGSO constellations while continuing to launch critically important satellites for government agencies. They should be cautious, however, in preparing for a potential future increase in launch rates. The increase may not happen as soon as planned and the overall level of increase may be less than anticipated. Should a constellation developer fail to meet an FCC milestone or otherwise suddenly cease launch operations, an immediate and precipitous decline in future launch demand could result. SpaceX is the only vertically integrated large constellation provider. SpaceX will build its own satellites and will use its own rockets to launch its broadband constellation. If there is a dearth of launch providers serving the NGSO market, access to launch capabilities through vertical integration could be a significant strategic advantage. There are 11 commercial spaceports licensed by the FAA in the states of Alaska, California, Colorado, Florida, Oklahoma, New Mexico, and Virginia.§,21 The Eastern and Western launch ranges, located at Cape Canaveral Air Force Station and Vandenberg Air Force Base, respectively, are managed by the United States Air Force and operated with the assistance of a fixed-price contract that has specified limits on the annual number of launches. An increase in launches above this level may require a commensurate increase in funding along with the hiring and training of new workers. Government officials advocating for new spaceports or managing existing spaceports and launch ranges will need to consider the long-term launch market outlook and whether they can “close the business case‚“ for additional spaceport investments. § Three of the eleven spaceports are colocated at government facilities: Spaceport Florida is colocated at Kennedy Space Center/Cape Canaveral Air Force Station; California Spaceport is colocated at Vandenberg Air Force Base; and Mid-Atlantic Regional Spaceport is colocated at NASA‚Äôs Wallops Flight Facility in Virginia. Orders for large geostationary satellites are down, with just eight orders placed in 2017.22 This decline is largely attributed to satellite operators redirecting investment from traditional GEO satellite communications to NGSO constellations and the increased capacity offered by existing and planned high-throughput satellite (HTS) GEOs. If significant delays to the new constellations occur, or if their viability seems at risk, there could be a resurgence of orders for large geostationary satellites. 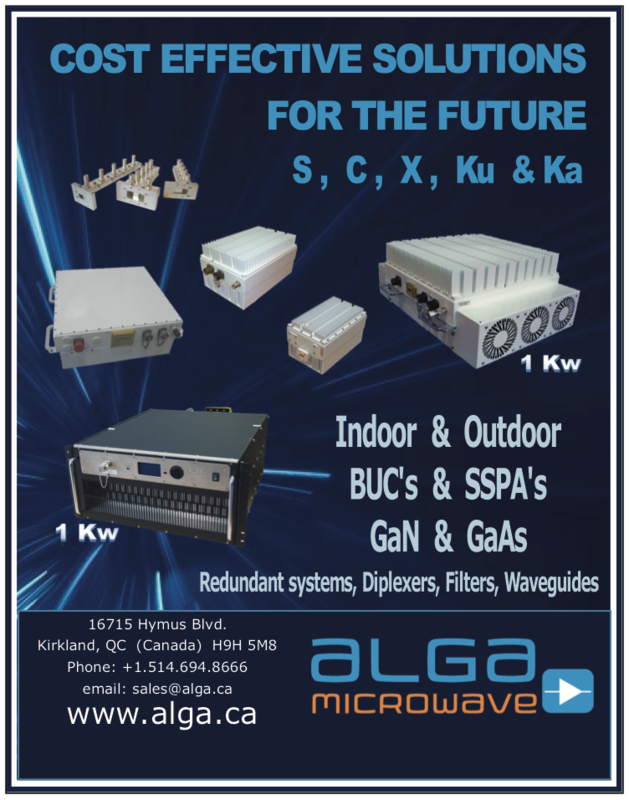 The multi-year time frame from satellite order to availability of that satellite could also result in a service gap. A recent SpaceNews article addressing the need for orbital debris removal in the era of large constellations points out, “The megaconstellations promising global broadband service are heightening concern about orbital debris and creating demand for space-based trash collection,“ and cited several companies looking to provide active debris removal services.23 Constellation deployment delays will postpone demand for such services. While delays provide additional time for removal capabilities to be proven, they also postpone the removal service providers’ revenue streams and likewise threaten their viability. It is noteworthy that orbital debris service providers may become a source of future launch demand. Risk management begins with gaining an understanding of potential launch delays and how they can impact constellation deployment milestones. Historical data is analyzed to develop probabilities for individual launch delays and the duration of the delays. Simulation modeling is used to determine the cumulative effects of launch delays. If the potential impact is deemed to be problematic, then mitigation steps can be taken. The proposed new constellations are not likely to impact launch availability for U.S. government programs with appropriate mitigation measures in place. These could include service level agreements with the launch providers and evoking government purpose priorities to mitigate launch delay risks stemming from the potential increased launch demand. Nonetheless, all launches are subject to delay risk. Figure 1. Launch delay risks. During the three-year period of calendar years 2015 to ì2017, 66 out of 71 U.S. launches were delayed, according to Spaceflight Now‘s launch history log.25 This database only captures delays that occur within approximately six months of the planned launch date, which is when Spaceflight Now typically starts tracking a launch. However, delays relative to a company’s business plan can occur prior to that point. Delays range from a single day to years. Causes of delays vary, and we have grouped them into three categories: sourcing delays, launch site delays, and flight anomalies, as shown in Figure 1. Additional details on each subcategory can be found in the appendix. Causes of launch delays need to be accurately documented. Peter Drucker’s famous saying, “If you can’t measure it, you can’t improve it,’ aptly applies. Slip charts provide an excellent method for documenting launch delay history. They portray the time when a delay occurs relative to the planned launch date and the magnitude of the delay, as shown in Figure 2. The planned launch date displays as a horizontal line so long as the launch date holds. A slip is displayed as a vertical step corresponding to the date the slip occurred and the magnitude of the slip, with a note describing the cause of the delay. Analyzing the rich data in a collection of slip charts allows development of estimates for the likelihood of future delays, when and where they typically occur, and the potential magnitude of the delays.26 Launch service customers are well advised to request historical slip data from launch service providers to assess launch delay risk. We also propose a future launch rates working group, described later, to lead a study of delay risks across the launch industry. Such an effort could start by capturing and maintaining slip charts on all launch campaigns. Launch service providers, satellite manufacturers, and launch range officials could be encouraged to share launch delay historical data to firmly ground analyses and aid in the search for common causes and best mitigation practices. Slip charts could also be used by the FCC to make better informed decisions when determining whether or not to grant waivers if and when deployment milestones are not achieved. If the collection of slip charts indicates that the preponderance of the delay reasons was beyond the reasonable control of the licensee, the granting of a waiver would likely be warranted. It is also important to establish up front how best to address when it is appropriate for the FCC to grant waivers in order to ensure a level playing field. Simulation modeling is widely used in operations research and for analyzing almost any system or operation, including manufacturing systems, transportation systems, and supply chains. Discrete event simulation, similar to Monte Carlo analysis, models a system as it evolves over time and where system state variables change at discrete points in time.27 It is ideally suited for modeling a constellation’s lifecycle from design, manufacturing, deployment, and sustainment. Entities within the simulation can include individual satellites and launch vehicles. Examples of state variable changes within the simulation would be the acts of completing a satellite’s manufacturing, transporting it, and launching it into orbit. The occurrence of any launch delay risk (shown in Figure 1) would also be “discrete events,” which contribute to whether any one constellation will meet its prescribed milestones. 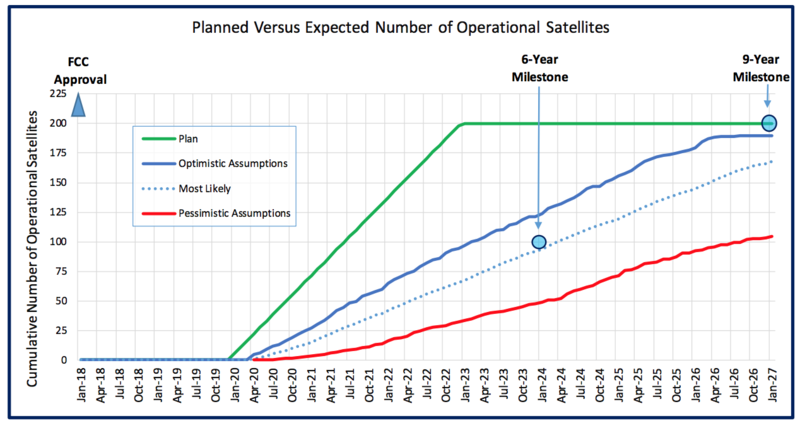 Constellation stakeholders can refer to constellation simulations and the completion quantity distribution functions they provide, which show the number of spacecraft in operation as a function of time and, most importantly, how many satellites will be operational at the FCC’s six- and nine-year milestones. Figure 3 shows a notional constellation of 200 satellites with an FCC approval date of January 2018. The green line represents the planned number of satellites on orbit with the total constellation being deployed in five years per that plan. However, the simulation results with the model being run with either optimistic or pessimistic assumptions suggest otherwise. This notional analysis indicates that the satellite operator is at significant risk for not meeting FCC milestones despite a deployment plan that offers considerable schedule margin. The simulation would then be used to explore mitigation strategies that would improve the expected outcome. Figure 2. Example launch date slip chart. Launch service providers, constellation operators, and regulators should examine supply and demand models to better plan and predict launch availability or supply, launch demand, and resultant launch costs or pricing. A launch simulation output metric could be the expected number of launches, which launch service providers and launch ranges can use to better understand the possible number of launches required in the future. While a constellation developer would likely desire a simulation focused solely on a specific constellation, other stakeholders might be more interested in a model that considers all constellations along with other planned launches. These launch models could also be used to predict future launch pricing by applying both launch supply and demand forecasts. Depending on the demand elasticity (price sensitivity) of certain NGSOs, such pricing models could be used to help forecast future business model changes or even failures. Launch cost is an important component of the overall satellite constellation. A study on the overall price elasticity of NGSO providers could shed light upon the market dynamics of NGSOs. Governments are often the major drivers of space capability establishment and growth — for diversifying their economies as well as building strategic national capabilities. Figure 3. Notional 200 satellite constellation deployment analysis. To this end, the United States’ Space Policy Directive-2 (SPD-2), “Streamlining Regulations on Commercial Use of Space,” issued on May 24, 2018, encourages American leadership in space commerce and establishes space policy to promote economic growth and minimize uncertainty for both taxpayers and investors. • A review of export licensing reviews. The U.S. government could charter a working group to improve launch demand situational awareness for the benefit of all U.S. space launch stakeholders. Beyond streamlining regulations and establishing greater situational awareness of the launch market, the government may also want to consider other ways to nurture the domestic launch industry. The U.S. government has already established a protectionist policy for the domestic launch industry by requiring that U.S. government payloads use U.S. launch vehicles. Going one step further (and not without controversy) the U.S. government could consider the circumstances where it would provide additional assistance to the NGSO constellations. If the U.S. government deems that assistance to NGSO constellations is in the national interest, it would need to determine what types of assistance are appropriate, potentially including regulatory relief, financial assistance, and even technical assistance. For example, various government agencies and federally funded research and development centers could offer technical assistance. If some constellations are important to national interests, the U.S. government may want to consider a partnership whereby government funding is provided to the commercial sector for future services. Improving future launch demand situational awareness would be beneficial to multiple U.S. government entities and other spacefaring nations. The Eastern and Western ranges, as well as other domestic launch sites, can use projections in preparing to meet future launch demand. The FCC can use launch demand estimates, along with launch capacity assessments, to better understand the likelihood of constellation license applicants being able to meet the FCC’s six-year and nine-year deployment requirements. The Air Force can use the information to inform future acquisition strategies for their launch needs. Understanding the expected number of future launches is critical to making accurate predictions of future orbital debris risk. The Department of Commerce could apply launch demand projections as they work to ensure that the U.S. captures a sizable percentage of the launch market and to consider how to streamline regulations. An inter-agency working group is recommended to bring together future launch demand information from the FAA, the Department of Defense (DoD), NASA, the FCC, and private industry sources. With a charter to develop and maintain present and future launch demand situational awareness, this working group could develop an understanding of the U.S. launch market and worldwide launch demand. • Current Launch Schedule (CLS). The Air Force produces a product called the that extends approximately three years into the future and includes government and commercial launches from the Eastern and Western launch ranges. The CLS is the authoritative product for near term launch schedules. • National Mission Model. The Air Force addresses government launches that extend another seven years beyond the CLS. • Annual Compendium. The FAA provides information about commercial space transportation, including estimates for commercial launches over the next 10 years. • International Space Station (ISS) Flight Plan. NASA maintains a flight plan showing U.S. and partner nation launches to the ISS. • Commercial Sources. Several commercial sources could provide information on future launch demand such as SeraData’s SpaceTrak, the Teal Group’s World Wide Mission Model, and Northern Sky Research (NSR). • Launch Service Provider Information. Information from launch service providers would be of value to the working group. The existing products, described above, do not currently identify the launches required to deploy the proposed constellations. Consequently, the working group would need to develop estimates for the number of additional launches required and when they are likely to be planned. The FCC license applications provide valuable information, but making future launch estimates requires additional information such as satellite launch mass and volume, anticipated failure rates, planned numbers of satellites per launch, intended launch vehicles, and launch schedules. While one product of the working group would present the planned number of future launches as described above, a second product would be an analysis of the expected number of launches that will occur on an annual basis. This analysis could be accomplished through simulation based tool to account for launch range capacity, launch service provider capabilities, and launch delay risks. Understanding launch delay risks in particular is likely to be important to many stakeholders. Regulatory relief may ultimately prove to be necessary to ensure the success of the proposed NGSO constellations. Changing a rule, granting a waiver, or approving a license modification may be perceived as unfairly assisting a licensee to the detriment of competitors. Rather than waiting several years, the FCC and other regulatory parties, working closely with the satellite industry, could start meeting on a regular basis to develop ground rules to allow for greater future regulatory flexibility while maintaining fairness among the competing parties. This might serve to reduce both regulatory burden and industry angst. Such actions would be consistent with the administration’s efforts to make space regulations less burdensome and to encourage U.S. space industry growth and competitiveness. Large NGSO satellite constellations will play a strong role in closing the digital divide, demonstrating U.S. commercial leadership in space, and providing unique satellite service opportunities for government and private sector customers. Yet, there is no guarantee that these constellations will make it from the drawing board to reality. Their arrival depends upon many factors, including technical viability, availability of financing, ramping up U.S. launch capacity, and the herculean efforts required to produce, launch, and maintain unprecedented numbers of satellites. 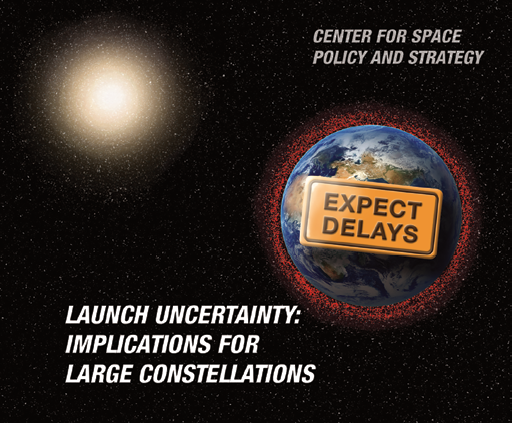 Launch delay risks will be pervasive throughout, and the cumulative impact of launch delays to large constellations will likely be measured in years. Some risks may be mitigated via the addition of launch processing infrastructure, increased workforces, judicious use of overtime, ample schedule margin, and potentially regulatory relief. However, even with such mitigations in place, a significant level of delay risk will remain. That risk should be thoroughly analyzed, constantly monitored, and communicated to the NGSO stakeholders as well as the government agencies that rely upon timely satellite launches to meet their mission needs. The microeconomic principle of economies of scale refers to reduced costs per unit that arise from increased total output of a product. For instance, a launch provider could provide an increased quantity of launches and spread launch site infrastructure costs and general technical and operational support costs across all launches; thus, reducing the costs per individual launch. Diseconomies of scale might occur after output quantity exceeds an optimal design point. It remains to be seen where such a diseconomy will occur for the launch industry as no historical precedent exists. There are, however, potential scenarios where diseconomy might occur for an unprecedented level of space launches. Why is this significant? 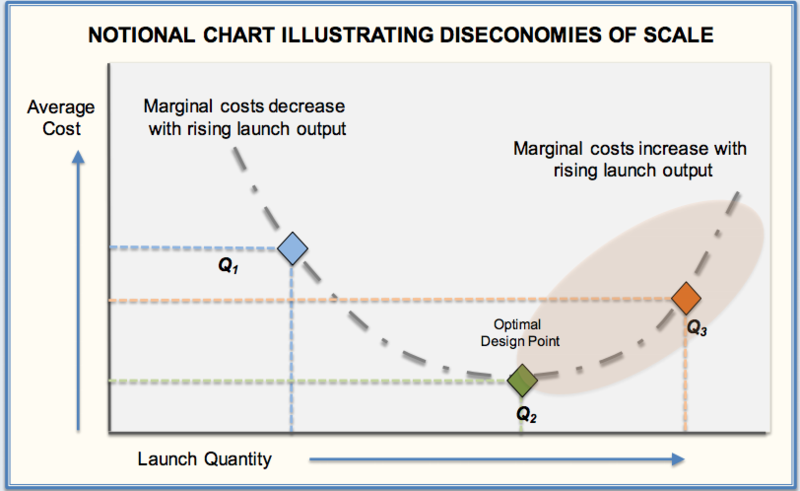 Marginal cost increases could increase launch prices over time, dampening future launch demand. • Launch sites may need additional capital improvements to stage and launch frequent launches. 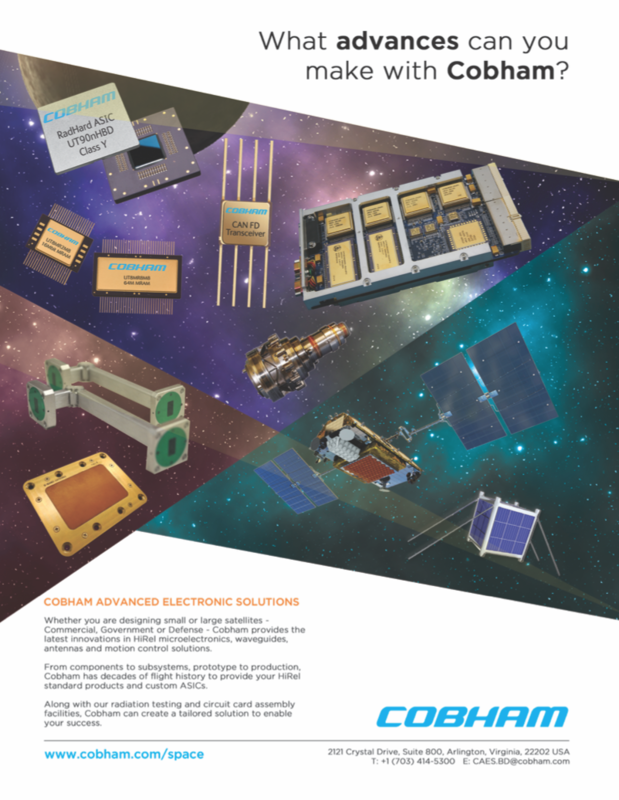 • At what satellite manufacturing volume level would satellite manufacturers reach the optimal design point? • At what launch volume level would a launch provider reach the optimal design point? • If diseconomies occur, how long would this scenario last before the industry adjusts supply capacity to meet these new unprecedented levels for satellites and launch services? All market participants and regulators should watch closely to observe any adverse trends. 1 FCC Fact Sheet, “Updating Rules for Non- Geostationary-Satellite Orbit Fixed-Satellite Service Constellations Report and Order and Further Notice of Proposed Rulemaking,‚" IB Docket No. 16-408, September 7, 2017. 2 See 47 CFR ¬ß 25.164(b)(1) and 47 CFR ¬ß 25.164(b)(2). 3 Erwin, S. “Commercial space technologies a key theme in Air Force intelligence and data strategy,‚" SpaceNews, August 2, 2018. 4 FAA “The Annual Compendium of Commercial Space Transportation: 2018,‚" January 2018, p. 47. 5 Statement of Commissioner Michael O‚ÄôRielly, Re: Update to Parts 2 and 25 Concerning Non- Geostationary, Fixed-Satellite Service Systems and Related Matters, IB Docket No. 16-408, September 27, 2017. 6 Brown, N., et al. Spacecraft Lifetime Study, Aerospace Report Number TOR-2010(8582)-3. The Aerospace Corporation, El Segundo, CA, 2010. 7 Gould, Allen J., and Orin M. Linden. “Estimating satellite insurance liabilities.‚" Casualty Actuarial Society. 2000. 8 Saleh, Joseph Homer, and Jean-Fran√ßois Castet. Spacecraft reliability and multi-state failures: a statistical approach. John Wiley & Sons, 2011. 9 McIntyre, S., et al. “A Commercially Driven Design Approach to UK Future Small Payload Launch Systems‚"; BIS-RS-2016-17; October 2016. 10 Henry, C. “OneWeb shifts first launch to year‚Äôs end,‚" SpaceNews, May 1, 2018. 11 FAA, “The Annual Compendium of Commercial Space Transportation: 2018‚"; January 2018, pg. 45. 12 Review of Spaceflightnow.com‚Äôs Launch Log. 13 Gwynne Shotwell interview with CNBC, May 22, 2018. 14 Henry, C. “Iridium raising new debt to cover late Aireon payments,‚" SpaceNews, February 26, 2018. 15 Northern Sky Research; “Satellite Constellations: Too Much of a Good Thing?‚"; August 1, 2018. 16 OneWeb Satellites, http://onewebsatellites.com/ (accessed August 31, 2018). 17 Sargent, A-W. “Commercial Satellite Sector Sees Upside to New Space Policy Hopeful of ITAR Reform, Greater Stake in U.S. Roadmap for Space,‚" ViaSatellite, January 1, 2011. 18 Erwin, S. “Senate defense bill proposes big funding boost for military LEO constellation,‚Äù SpaceNews, June 7, 2018. 19 Henry, C. “Iridium raising new debt to cover late Aireon payments,‚" SpaceNews, February 26, 2018. 20 Foust, J. “The launch industry depression: when will it end?‚" Space Review, March 17, 2003. 21 https://www.faa.gov/data_research /commercial_space_data/licenses/#operatorLicenses, accessed August 30, 2018. 22 Satellite Industry Association, “2018 State of the Satellite Industry Report,‚" June 2018. 23 Werner, D. “Rise of the megaconstellations breathes life into active debris removal schemes,‚" SpaceNews, April 18, 2018. 24 Henry, C. “Kepler Communications opens launch bids for Gen-1 LEO constellation,‚" SpaceNews, August 29, 2018. 25 https://spaceflightnow.com/launch-log/, accessed June 14, 2018. 26 Lucko, G., L. G. Ara√∫jo, and G. R. Cates. “Slip Chart‚ÄìInspired Project Schedule Diagramming: Origins, Buffers, and Extension to Linear Schedules.‚" Journal of Construction Engineering and Management (2015): 04015101. 27 Law, A. M. Systems Modeling and Analysis, 5th Edition, McGraw Hill, 2013. 28 Cates, G. R. “Launch Probability in NASA Space Launch System,‚" Arena Newsletter Issue 18: Taking the Uncertainty Out of Project Management, October 2017. 29 Cates, G. R., and Mansooreh Mollaghasemi. “A discrete event simulation model for assembling the international space station.‚" Proceedings of the 37th Conference on Winter Simulation. Winter Simulation Conference, 2005. 30 The Aerospace Corporation. “Accuracy Is Worth Millions: $18 Million Saved by Accurately Predicting Future Launch Rates,‚" Delivering Innovation, Issue 12, March 2018. 31 Trump, D. J. “Space Policy Directive-2: Streamlining Regulations on Commercial Use of Space,‚" May 24, 2018 (https://www.whitehouse.gov/presidential- actions/space-policy-directive-2-streamlining- regulations-commercial-use-space/). 32 Jones, K. L. “Public-Private Partnerships: Stimulating Innovation in the Space Sector,‚" The Aerospace Corporation, April 2018. 33 Federal Communications Commission, “Updating to Parts 2 and 25 Concerning Non-Geostationary, Fixed-Satellite Service Systems and Related References Matters,‚" paragraph 62, IB Docket No. 16-408, Released September 27, 2017. 36 Statement of Commissioner Michael O‚ÄôRielly, Re: Update to Parts 2 and 25 Concerning Non- Geostationary, Fixed-Satellite Service Systems and Related Matters, IB Docket No. 16-408. 37 Henry, C. “OneWeb asks FCC to authorize 1,200 more satellites,‚" SpaceNews, February 26, 2018. Grant R. Cates is a senior engineering specialist at The Aerospace Corporation in Chantilly, Virginia. 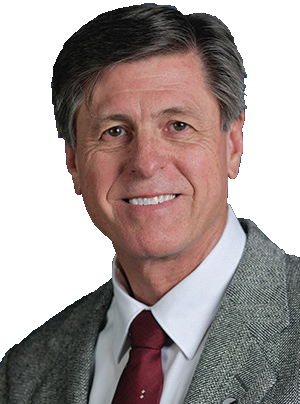 He has more than 30 years of experience in space launch and simulation modeling. His recent work and publications have focused on the use of discrete event simulation to advise the Air Force on future launch rates and NASA on the space shuttle, the International Space Station, human exploration of the solar system, and launch probability. Cates received a bachelor‚Äôs degree in engineering science from Colorado State University and a master‚Äôs degree and Ph.D. in industrial engineering from the University of Central Florida. Daniel X. Houston is a senior project leader at The Aerospace Corporation in El Segundo, California. He applies qualitative and quantitative analytical methods, including statistics and simulation, to industrial and software engineering processes. Houston received a B.S. in mechanical engineering from The University of Texas at Austin and a master‚Äôs degree and Ph.D. in industrial engineering at Arizona State University. 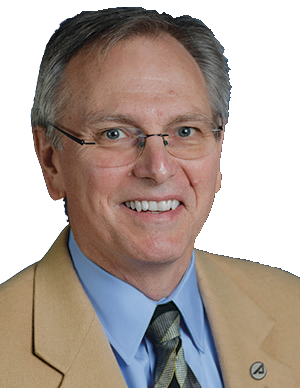 His publications include statistical modeling and simulation of software development processes, software process improvement, and the management of software projects, with a focus on risk, product quality, and economics. Douglas G. Conley is chief engineer of Launch Program Operations at The Aerospace Corporation in El Segundo, California. 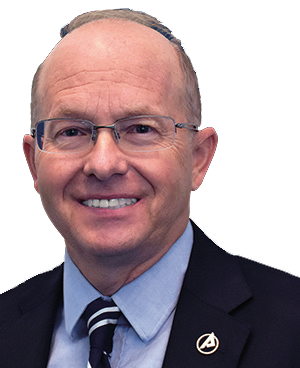 He has been engaged in domestic and international space launch programs spacecraft systems engineering, and mission assurance for over 35 years, mostly in the commercial realm before joining Aerospace in 2016. Conley received a B.S. in engineering and applied science from Caltech and a master‚Äôs degree in dynamics and control from the University of California, Los Angeles. 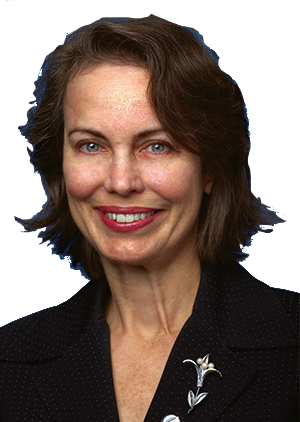 Karen L. Jones is a senior project leader at The Aerospace Corporation‚Äôs Center for Space Policy and Strategy. She has more than 30 years of experience as a management and technology strategy consultant across diverse industries, including federal government, information technology; telecommunications; wireless technologies; remote sensing; satellite industry, environmental technology and services, oil and gas, mining, and renewable energy. She received a bachelor‚Äôs degree in geology from Louisiana State University and a master’s degree from the Yale School of Management. The Center for Space Policy and Strategy is dedicated to shaping the future by providing nonpartisan research and strategic analysis to decisionmakers. The Center is part of The Aerospace Corporation, a nonprofit organization that advises the government on complex space enterprise and systems engineering problems. The views expressed in this publication are solely those of the author(s), and do not necessarily reflect those of The Aerospace Corporation, its management, or its customers.